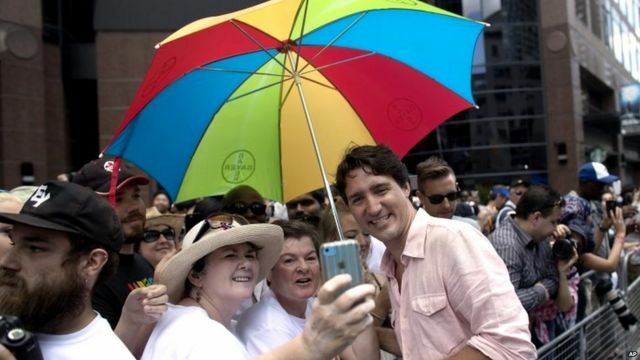 Trudeau joins Canada gay pride march Jump to media player Canadian Prime Minister Justin Trudeau has become the country's first head of government to take part in Toronto's annual gay pride parade. 'Out and proud... not proud of being out' Jump to media player Tens of thousands of people have joined the Pride parade through central London. Gay rights protest held in Mumbai Jump to media player A gay pride march is held in Mumbai to protest against the lack of rights for non-heterosexual and transgender people in the country. Kiev gay pride march 'a test for society' Jump to media player A gay pride event passes off peacefully in Kiev as thousands of police officers are deployed to stop far-right extremists from targeting it. Boom! Trudeau joins Invictus rivalry Jump to media player Canadian Prime Minister Justin Trudeau is the latest world leader to publicise the Invictus Games with a Twitter video in which he shows how his country "brings it". Canadian Prime Minister Justin Trudeau has become the country's first head of government to take part in Toronto's annual gay pride parade.